This is a Phil Mickelson 2010 Masters Champion - Laser Engraved Signature - Framed Display. 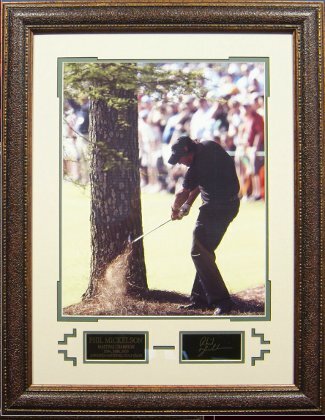 This features the Laser Engraved Signature (Replica Autograph) of Phil Mickelson, with a 16x20 Photo of Mickelson hitting "The shot of his career" from behind the tree on the 13th with Museum Quality Leather Framing as shown with descriptive plaque to an overall size of 32x25". The signature moment came on the par-5 13th, with a 2-shot lead, he was stuck between two Georgia pines and had just over 200 yards to the pin, with Rae's Creek guarding the hole, he swung the shot of his career dropping the ball three feet from the cup.